It's unlikely to be needed, this is more of a question. If your first vertical pipe was tall enough to bring the horizontal right up to the apex of the flaps... I'm thinking there'd be less heat delivered to the flaps and would be just that much more heat in the tent. Also, in stove lingo do horizontal and vertical runs of chimney have specific names? Pretty cool ya got the grate from XJ. And it's pretty easy to see the advantage of a straight shot through the roof, that being less material to carry along the trail, and there's just a little more heat delivered inside. Unknown, I was thinking that too. If those pipes are the snap closed style, You could open one and cut it to length to reach the apex. The cap would end up a little lower but it all might come together perfectly. Thanks for your replies guys. 2 thoughts from me which fit into you guys way of thinking. I agree with the idea of raising the pipe off the stove. I have 1 section left and can cut it pretty easy. Half of it will probably be about right. I do want to stay 8 inches off the canvas. That's just a number I think will work well. I'm leaning more toward using the flap closure. Situating the pipe again will be an improvement. Keeping the fire proper is the key. I've had her fired up real good twice now and I think staying warm and safe is very doable with this setup. The wrap around the pipe is key and fairly cheap. I'm searching stove jacks as I post this reply. I've been looking into wood cook stoves, a few days ago watched a vid with some folks who had to set their stove close to an adjacent wall. Initially they protected the wall with Aluminum foil. Later they thought to get something more permanent and got a stainless steel panel. They said it wasn't long before they went back to the foil which worked to keep the wall cool. The heavy SS held heat and would get super hot. I can picture that, but the foil working so well is surprising in some ways. Just some info that might help or maybe not just for insurance. I also thought of double section, a sleeve, but some crumpled foil might save the day if you go for an extended burn. Maybe you did burn it all day and I missed it. I thought to mention it in my last post, one thing we onlookers should recall is the jacket you made. My sewing would likely devalue the canvas. 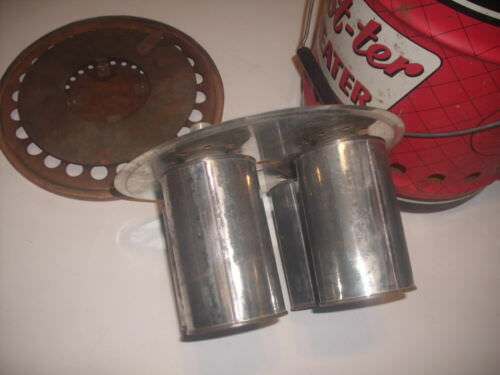 As neat as you do it, it would likely increase the value except to a pure BSA collector. I'm actually going to try and pick up an old fireplace screen to put around it where you come through the flaps. If it fits in half way right it will make the setup safer. I took my last piece of pipe to work with me today to cut it down some so I could extend the pipe out of the stove a little. I forgot to bring it home with me. This weekend, I guess I'll just have to build a fire in it and enjoy it as is. I did order a USGI stove jack last night. So to everyone's enjoyment I can keep pounding this thread. Gotta love youtube. Some strange things can be found there. 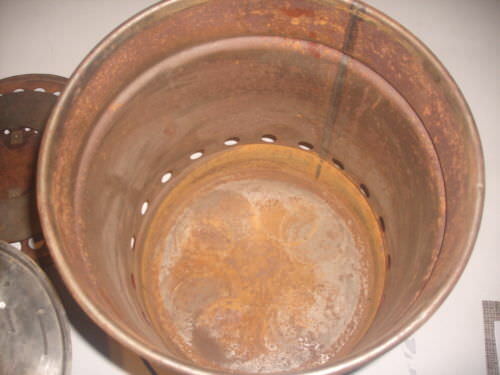 If you find this stove puts out too much heat, try this. 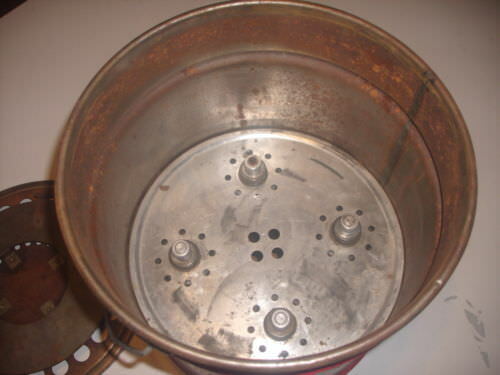 It's a multi tea light "stove" for heating and also an Oven attachment. Kind of cool but not worth it's own thread. Starts at the 3 minute mark. I like it! We use the same method. However, I think now, in it's present location, I could have my tent and stove set up and we'd all be getting warmer, in the time it takes to watch that vid. I'd have to have my fire prep done though. I can't wait to sleep in this thing. I need to get a fire extinguisher. Pretty impressive little saw! What kind was it......anybody know! Looks similar to a fixed blade Fiskars, which when I used it in a similar fashion without gloves and my had as close as his was caused me to leak and get 12 stitches. I'd guess it to be a type of older grafting saw. Or maybe something like an old school "Handy Saw"
His blade looks a different shape. His hand hold makes me think it's an open grip like this, or maybe just "straight" had to look again.... looks like a straight grip. Whatever it was, it chewed through that branch in a hurry! That's what it looks like......Thanks, xj! I think I'm going to keep beating this dead horse. LOL. This looks way more feasible than the tara cotta pot heater. Tent stoves are cool. I bet the tin can is warm. My neighbor has been in the tent once and yesterday met me with a big bag of 6 inches stick he picked up out of his yard and saved for me. Tent stoves are cool. Mine works good so far. If he burns it up, I can see him loading up the big Chevy with pallets. Then building a micro cabin with a loft ! i mean the floor is done already so. Hate to do it to you guys but I took a photo in low light with new cam so I'm posting it up so I can compare to my other crappy pics. Home sweet home in very low light. Oh, and I have no intention of burning up my tent. I am very careful. Stove jack is in the mail. Looks good to me, just like Lulu. Not a crappy pic at all. Looks like heaven. +1, I was just thinking the same thing! Thanks guys. It is a good place. Lost a big pine near it in the wind today. I hope its twin beside it that is leaning comes on down tonight before the wind stops blowing. I'll post a pic. looks like hohe sweet home. 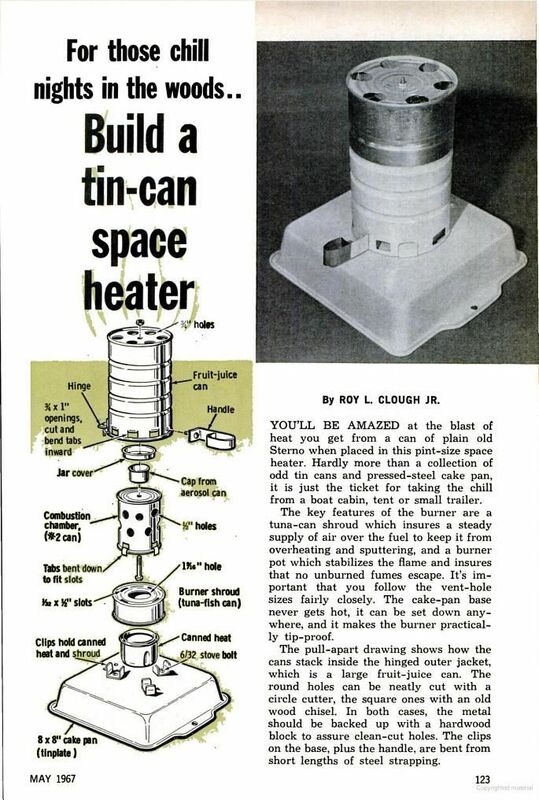 I've gone back and looked at this article several times now and I think I'm going to build one. I have a small tarp tent I made some years ago and I bet it would be the shizzle in it. Thanks for posting xj. I like the date on it too. I have too many projects, not close to completed. I spend too much time researching stuff on you tube. My thinking today is making my nesting cooking setup into also a tent heater. I'm thinking about a very small barb fitting on the edge of my trangia and an I.V. Flow valve connected to a water bottle hung upside down to feed the trangia. Maybe get an 8 hour burn out of it. And have it set up something like this. Still camera testing. Been too hot to think about firing up the heater. We have had some nasty weather and it has all weathered well. I was thinking of you today Creek, I stopped in a surplus store down the road and saw one those military gas fuel heaters. i really like that deck for your tent. what a view that must be. we have a couple of those wood stoves. like them alot. you can toss some nice chunks of wood in there. we use one in our tipi with only 4ft of stove pipe. the smoke draws the rest of the way out and never smokey inside, great for cooking on too. Well, Well, Well, Lookee what I found by accident on e-bay. 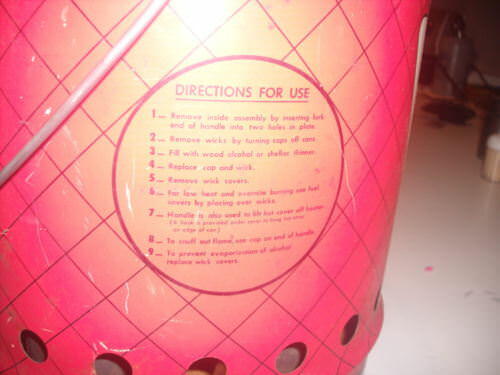 Notice all the holes for the draft of air to heat and get out. It seems too simple. Denatured alcohol is wood alcohol right? We have a HUGE denatured alcohol plant about 9 miles from here, but we call it ethanol......made from corn-squeezin's! Ours uses supplemental methane gas, which comes as a by-product from the regional landfill, to heat the mash and distill the alcohol. Pretty cool! 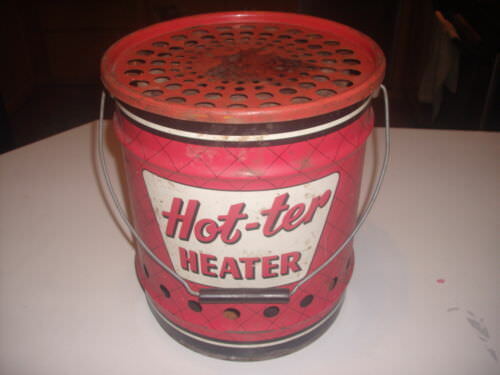 I bought a little catalytic style heater that runs off those green propane bottles that always seem to be on sale at Walmart. It sure made life a lot more pleasant in the deer blind when it's in the low-teens or single digits outside. I sit on a stool with it between my feet and a poncho made from an old army blanket with a hole for my head to poke through in the center. No odor that I OR the deer can detect because I've had them within a couple of feet of the blind and they didn't seem at all aware there was anything amiss.